Hofstra Student Life: We All Have Pet Peeves, including Employers....So Steer Clear of These! We All Have Pet Peeves, including Employers....So Steer Clear of These! Sometimes we get so busy with our lives, whether it be school, work, and family, that we forget about the important details that may cause us to get the internship or job. Over the years, I have experienced a few things that are real red flags for candidates. We also hear A LOT from the employers so please keep in mind that even though you may think they are "minor" mistakes, they actually will knock you out of the running. 1) Check your voice mail! If an employer calls a candidate's cell phone to schedule an interview and they leave a voice mail, it is so imperative to check that message before just calling back and saying "Uhhh, I received a call from this number?" The employer took out the time to call and leave a message, so it's only fair that you check the message before calling back. There may be detailed information that you want to make sure that you know before communicating with the employer. 2) Spelling Errors on Resume! 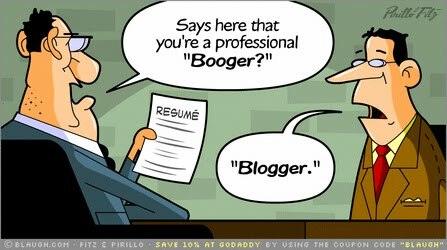 If there's ANY spelling mistakes on the resume, chances are there will not be an interview. Just a tip - spell check DOES NOT work on capitalized words. I have seen EUDCATION numerous times. 3) Keep track of what you applied for. If you don't keep track, an employer will call you and you will have no idea what job they are calling you about. RED FLAG right there! 4) Your cover letter has to be specific. I asked an alumna who posted an internship with us to let me know if she received any Hofstra applications. Her response: "Got a few bites. Most of them did not actually change their cover letters or resumes...We are not a 'Focus Features' internship and we will not help you with your objective to obtain an internship in the radio industry..." GULP! That should never happen! 5) Watch what you wear on an interview! I had an interview with a college grad that was actually a referral from someone I worked with at NBC. She wore flip flops to the interview. Granted, she did wear a suit, but just because she was referred from someone in the company, did not mean she was a "shoe in" for the job. 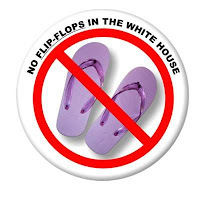 If they don't allow flip-slops in the white house, then that's your hint for no flips flops at an interview. And of course if you visit us at The Career Center, you will be properly guided, so please stop by and we'll make sure we give you the Do's and Don'ts!